This elegant jacket was made with a simple combination of geometric figures: triangle and diagonals. 1. Original jacket was made for a rather tall woman with small bust (90 cm = 35.5”) and hips (90 cm = 35.5”). Even though the jacket is stretchy and still fits a woman with up to 100 cm (39.5”) larger bust, the whole look and the proportions on another woman are different. 2. Small bust, narrow hips – that’s why you see this jacket straight and elegant. The same garment worn by a woman 165 cm (5’5”) tall with bust 100 cm (39.5”) and considerably larger hips was not as appealing. The jacket on such a figure was tight fit, crochet rib at the bottom was laying not freely over her waist – it ended under waist. When the rib was put over her waist there was a hump like we see in pullovers. Thus, the jacket should be ending way up to her waist. 3. The shoulder slope in such a diagonal pattern is very important – jacket worn on straight and rather broad shoulders looks beautiful. Of course original shoulder will not fit petite woman with narrow sloping shoulders. Even if her bust is small, the jacket must be altered to fit well. Wikipedia states that the height of 40% American women is 160 cm (5’3”) or shorter and roughly 25% are 155 cm (5’1”) or shorter. Of course all of them have different sizes and shoulder types which I can’t cover in my instructions for this jacket : )). After thinking that I can’t possibly satisfy all small and tall, with full and small bust, broad/narrow/sloping shouldered figures there was only one way – making instructions for my own item and advise crocheters to adjust this pattern for their unique figures. It is quite plain for any advanced crocheters that every item should be adapted for a particular figure and correct gauge should be obtained before embarking on a project. However many beginners think that if they see a pattern created for their size, they can just follow instructions without altering them for their individual figures. Alas! It can be done for a simple crochet top or a skirt (though the length of the garment should be adjusted too) but it will not work for a such an elaborate model like this triangle jacket. I have included tutorial of how to prepare a paper sewing pattern for the back. Or you can use any other instructions for making paper sewing patterns. Another possibility is attaching your work to any sewn jacket that fits you. Since the jacket is made without foundation row – it is started just with one chain in the centre of the back, you can follow the diagram until you reach the neckline. I have described 16 rows of the main pattern in words in case you have difficulties in understanding crochet diagrams. I hope after you have learned all these rows, you should be able to “read” decreases for the original jacket shown in the diagrams. And you can adapt them to your unique figure. 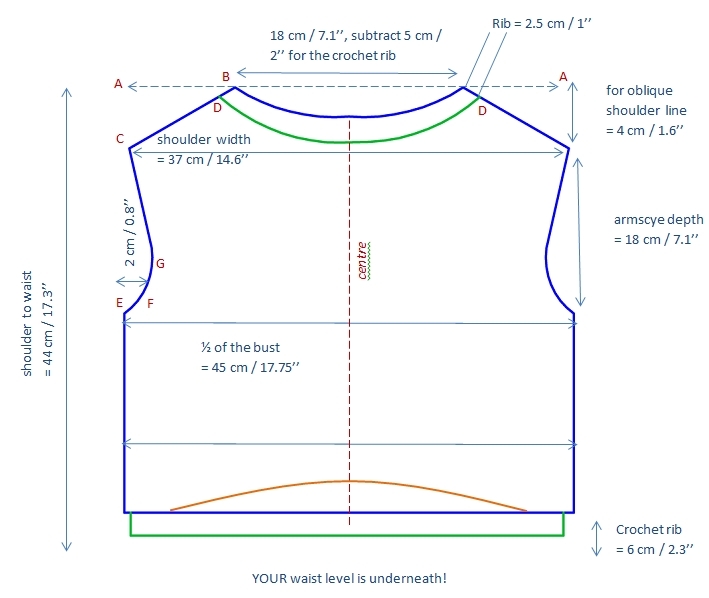 You may regard original diagrams of front, back and sleeves as examples for decreases or increases because you should regularly attach front and back to your personal paper sewing pattern. It might be that decreases are different – therefore this jacket is better to be worked by ADVANCED crocheter! ► instructions for creating paper sewing pattern – in such an elaborate item you should be able to adapt the diagonal pattern to your unique figure (petite or tall, with small or fuller bust, broad/narrow/sloping shoulders etc). It will be a great garment when it fits! ➽ Yarn Saver Tip: Before you decide to crochet any sweater made with thick yarn – please pay attention to sleeves and seams in photos. Whether the wearer hides all excessive width under her arms or garments have not flattering bumps at armholes? Many free crochet sweaters made with thick yarn, double crochet stitches (without chains in between) have T-shapes, because such sleeves do not require any shaping. T-shaped lacy kimonos made with thin thread do look fine because any excessive width drapes beautifully along the sides. All excessive thick double crochet stitches not only consume more yarn, but will be gathered under your arms (especially if you intend to wear sweaters under winter coats) because people are not built in T-shapes.